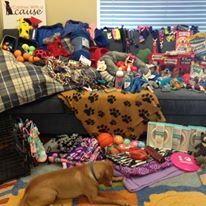 Canines With a Cause would like to express it’s appreciation to the caring and generous employees at Select Health in Salt Lake City, Utah. 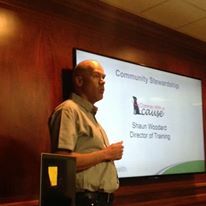 They invited CWAC to give a presentation about our programs to a group of employees who collected a huge pile of supplies, treats, doggie toys and cash donations. If your company or group wants find out how to support our programs to help save abandoned shelter dogs, Military Veterans and our prison training program please contact us at 801-792-1737 or email us. Ask your boss! Many employers have programs to match donations through payroll deduction plans or hold group activities and fundraisers for us like Select Health did. Canines With a Cause Salt Lake City, Utah is a registered 501 (c)(3) Non Profit Organization Rescuing homeless and abandoned shelter dogs, training military Veterans with PTSD or other psychiatric disabilities to train their own service and assistance dogs and providing female prison inmates an opportunity to apply basic dog training skills to the dogs recently rescued. Saving Three Lives!